When arrived to Dubrovnik it was already dark out. We took a bus from the airport to the old town and then we attempted to find our hotel. The directions for the hotel were not very clear but we ended finding it at the top of about 300 steps. Carrying a 19.8 kg pack plus another approximately 10 kg pack up all those stairs in the humid air of Dubrovnik was no small feat for me. I felt pretty accomplished when I reached the top. The first thing I realized when we were greeted by an elderly lady in her night-gown was that it was definitely not a hotel, rather it was a room in her home, complete with two large pictures of the Virgin Mary hanging above the bed. 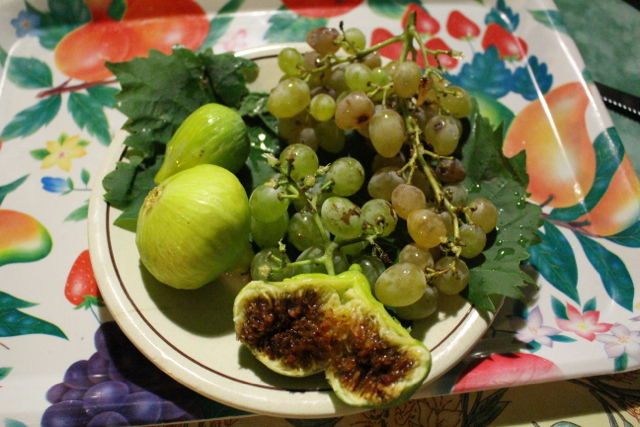 The woman spoke very little English and our communication was mostly done through hand gestures but she did make us feel at home by bringing out cold limeade, grapes and figs from her garden. It was a pleasant surprise and a refreshing treat after climbing up the steps. After settling in to our room, we went to explore the Old City. The Old City of Dubrovnik is composed of stone buildings with red clay roofs along cobble stone streets and surrounded by a huge wall that is at least 5 feet thick. At night, the walls are lit up and the grandeur and size of the walls is impressive. Over all, it was very quiet with only a few tourists walking around and enjoying a nice dinner. We found a spot to have a beer by the water and just relaxed awhile, enjoying the scenery. I loved it. I thought it was absolutely beautiful and so very peaceful. When we woke up in the morning and headed to Old town again, it was a completely different scene. There were tons of cruise ship tourists, it was hard to walk without bumping into one of their ridiculously huge ice cream cones. We had planned to walk the wall but it wasn’t until we tried to go up the stairs that we were told it costs 90 Kuna (or $16) per person just to get up there. So then we decided to go to the Old Fort and explore that area, only to find out that it costs 30 Kuna to get in there. I might add that we had stopped at the tourist information center and at no point when I was asking about these locations was I informed of the fees to enter. I was also never informed that there is a pass called the Dubrovnik Pass that costs 130 Kuna and you get 20 free bus rides and entrance to all 8 historic sites and museums. We didn’t find out about the pass until late afternoon, when another tourist informed us. All of this left a bit of a sour taste in our mouths about Dubrovnik. We felt that over all, the Croatian people, at least the ones in Dubrovnik, were not the friendliest. It would have taken to tourist information center less than 2 minutes to tell us about the pass, or even tell us about the fees, but instead, we were treated like we were a nuisance. Granted, we had just arrived from Greece, where everyone is incredibly friendly and set the bar quite high on being welcoming and accommodating, but still, I didn’t feel welcome in Dubrovnik. We ended up paying to walk to walls. It was worth the 90 Kuna but if you are planning on going to Dubrovnik, get the pass, it’s the most economical way to see the city. After walking the wall, at 2:30 PM on a very hot day in Dubrovnik, we found a spot that you can walk through the wall and access the sea so we stopped for a swim. It was so refreshing to jump off the rocks, maybe two meter high, all sweaty and gross, and feel an instant cooling relief. I love the sea, no matter where I am, so I think our swim did help give me a more positive attitude. After swimming, we went back to our room to take a nap and then we headed to the main bus station, a 15-minute bus ride from Old Town, to buy our tickets to Mostar, Bosnia for the next morning. After we bought our tickets we walked around the New Port area and had an awesome seafood dinner with fish, mussels, calamari and prawns, I drank a few glasses of wine and Ronen had a few beers. We took the bus back to Old Town, climbed all the stairs back to our room to pack and sleep a few hours before our early morning bus to Mostar. 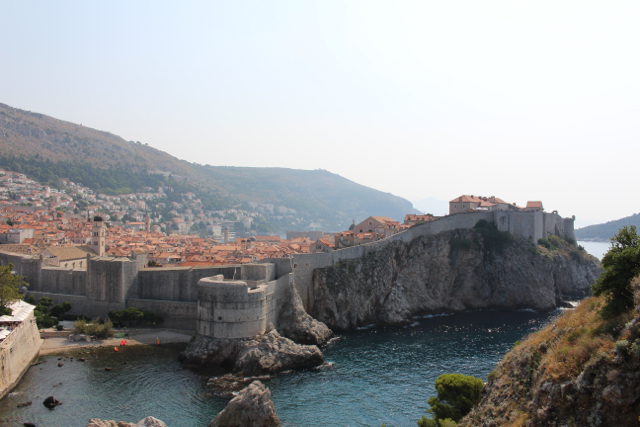 Over all, my feeling of Dubrovnik was that it is my least favorite place we have visited. It’s a beautiful city with amazing coastline and the sea is gorgeous, but the people could use some lessons on how to be nice and welcoming; they kind of ruined the whole experience for me.